I absolutely love getting comments on my blog. 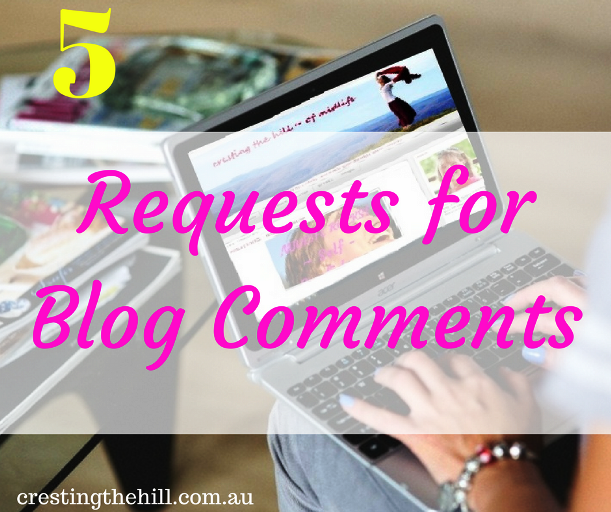 When I first started blogging I turned the comments off but I was missing out on so much. Once I took the plunge and opened up to the two way conversation I found I loved the connections with other people. I love the engagement, I love the affirmation, I love that people take the time to "talk" to me and share their response. But there are things I don't like about blog comments too - the snarky comment, the holier than thou comment, the token gesture comment, and the Wham, Bam, thank you Maam comment. 1. BE GRACIOUS - when someone writes a post, they are often sharing from their heart. They may have different life experiences to you, and different opinions, but that doesn't mean these things don't have value to the person writing. You may be further along the path of enlightenment, but you don't need to be snarky or one-up them with your vast wisdom and experience. Err on the side of grace and don't be 'that person' who has to prove their point. 2. BE GENEROUS - take the time to write something thoughtful, share a little of yourself, maybe a little anecdote that you have from your own life that relates to the post. Don't drop a few words as a token gesture and then think you've created interaction - when you really haven't made much of an effort at all. 3. BE BRAVE - if you never comment on blogs because you don't know what to say, stop for a moment and think how much the person you're reading would love to have you interact and share with them. It's not hard to create a commenting account if you don't have one - step up and take the challenge - there's a whole world of conversation waiting for you. I for one, would love to get to know you and to hear your thoughts. 4. BE RESPECTFUL - I feel belittled when a commenter takes what I've said and uses it to air their superiority on a subject. Everyone is at different stages in life's journey - respect someone else's life experience and encourage them - enrich their world rather than detracting from it. It's easy to be the know-it-all, the been-there-done-that person, the world weary pessimist. Instead, choose to be the Atta-girl commenter who respects where the writer is coming from without having to prove some point of your own. 5. BE ENCOURAGING - I love it when people comment positively, when they share their similar experiences, when they tell me they loved a particular paragraph or thought. It is such a big part of blogging for me - the relationships, the connections, the sense of being part of a midlife (and beyond) sisterhood who have each others' backs. If you're a hit and run commenter, a smarty pants commenter, a superiority complex commenter, an intolerant commenter, or a non-commenter, maybe it's time to take a step out of that world and share some light and love. Why not make the comment box a place of shared experiences, encouragement, grace and positivity? It's what I aim for when I leave a comment and I'd love it if everyone returned the love. Thoughtful comments that build a blogger up make such a difference to the process when you are bearing your heart and soul to the blogosphere. What sort of commenter are you? Oh dear. I fall into the non-commentator. I excuse it by saying I am too busy and read too many blogs. Maybe I should read less but engage more. Thank you for the lesson Leanne. Have a great Friday. Yep- blog words to live by. I tend to have much more engaging and thoughtful comments when a linky has a rule that you can comment on any posts that you want in comparison to those that have more stringent commenting rules. It makes blogging so much more fun when people stop by and say something thoughtful Kristin. I look at my page views and back at the comments and I wonder why we don't engage with each other more. Oh I totally agree Leanne I love engaging with others and I appreciate the positive comments I receive. I like your 5 reminders when commenting. We can't always agree with what others write, however, they have put time and effort into writing so leaving a gracious comment doesn't hurt. If you can't say something nice perhaps just share the post! I think we're all guilty of the occasional generic comment Janet, but as time goes by I find I'd rather read something and leave a thoughtful response than not bother to make an effort. Like you I love getting comments on my blog, but I know so many people read and leave. I often meet someone in person and they say, "I love your blog, and I particularly liked such or such post," and I'll say, "Thank you so much," while deep down I'm thinking, 'And I never even knew that you read my blog at all." So it's interesting. Some people are just too shy or too busy perhaps to comment, and don't really know what to say. And that's okay. But yes, it is so wonderful to get comments. I fall into the 'It happened like that for me' commentator I think! But I like to leave interesting comments that add to the conversation. Sometimes though it has to be a generic, 'that was a great post' comment because life can get so busy, but I think it's nice for the blogger to know I popped by. I have friends who tell me they read my blog Jo and none of them comment. I think non-bloggers are a bit scared of committing anything in writing on the internet. Those of us who've been blogging for a while let it all hang out and damn the torpedoes! I just love it when people connect and that's what makes blogging really worthwhile to me. I love connecting with my readers when they leave comments on my blog, especially when they ask questions so I can keep the conversation going. Thank you for these guidelines! I'm curious, how do you deal with spammy-like comments? Fortunately I don't get many spammy comments Monica - I have a 7 day filter on my posts so any comments older than that go through for moderation - most spammy ones appear on older posts and I can just delete them. I don't engage with mean commenters or spammy people - the delete button is my friend in those cases! Leanne, great points! 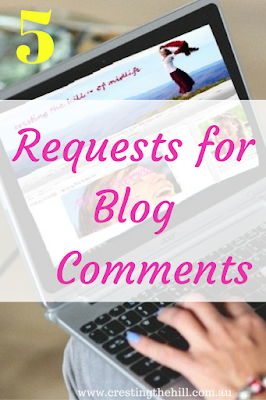 I can't imagine blogging with commenting turned off -- I really enjoy engaging with my readers. Sometimes they leave questions or recipe requests or even comment on something another commenter said. I try to leave meaningful comments on other blogs because I know how disappointing a few-word or even one-word comment (such as "Yum") can be. When I was new I was worried about whether people would leave unkind or thoughtless comments Jean - I have been overwhelmed with how lovely most comments are. But it's always good to remember that it's a conversation and not a tick and flick exercise isn't it? This makes a lot of sense. If I get a super snarky comment on my blog, I will sometimes mark it as spam so it is hidden. There is no need to expose other commenters to nastiness. Thanks for the great tips. I do the same Shari - some people are just in a darker place than me and probably sound snarkier than they mean to - but I don't need that on my blog and I'm happy to lose the comment rather than have negativity around. You are so right, I won't even publish those comments like "great post". I heard someone say once that a blog comment should add value to the post and that is really the bottom line and why I don't personally join any of those threads for comments. This was spot on and I comment as much as I can. You are so right about comments adding value Heidi - it's why we engage with each other isn't it? Why bother if you're going to leave two words or a comment that really makes no sense? I love comments that show the person has read what I wrote and thought about their response. I get super excited if someone comments on my blog. Unfortunately, being quite a niche in the blogging world, comments are as rare as hen's teeth. Most have been nice and friendly but one or two have tried to correct me on a point or two in a condescending way - no need. But even they are better than 'nice'. What's the point of that? Thanks A.J. and I hate it too when people pull the condescending tone when they are trying to show how much further along the path of enlightenment they are than me! I'm happy to admit I don't know it all and I just want to share my journey - I don't need to be patronized in the process. I have to admit that I read a whole lot more than I comment as well. I don't know why...because I know that I love when people comment on my posts! I am always in such a hurry to get to the next thing. Thanks for the great reminder that commenting really does matter and we need to be supportive of each other in leaving them. I don't agree with everything I read, but I appreciate the time that people take to write it. I'm the same Tricia - sometimes I'm wondering what to say that would actually be a meaningful engagement - and I won't comment if I have nothing worthwhile to say. That being said, I still try to add a couple of sentences to say I've visited and read and thought about what the blogger was writing about. This resonated so well with me, Leanne! (Will Write for Comments.) I've had all kinds, too, so I do hope I don't fall into one of those categories! The worst was the troll, who finally forced me to put moderation on my blog for a couple of years. I use comments as a thermometer. Am I warm? Am I cold? Am I just out to lunch? I am very lucky--the vast majority of commenters on my site meet your criteria. I have gotten very few trolls--maybe my spam catcher gets them. It's not the trolls that bother me Carol, it's the Negative Nellies and the patronizing commenters who annoy me the most - be kind and gracious - not supercilious is my main request here. I'm a social girl, so I really enjoy the comments on my blog too!! It's even fun to read other comments on other blogs!! And I'm one of those that even likes to reply to the comments....even if it's just a thanks! I guess I like communication, so it seems weird not to reply back! I would say comments are always good; but sometimes they aren't. Even though I'm self-hosting on Wordpress, I get a LOT of spam. You know..the 'your website is great but I can show you a way to make your traffic explode. Just click www.scamwebsite.com'. I do try to comment on other blogs, but I'm afraid I'll sound like a rambling idiot. Like right now :D. Best of luck on your blog! I don't seem to get much spam Matt - I guess they're looking for bigger fish to fry. If I do, they hit my older posts and those are moderated so I just delete them. And I love a rambling comment - it reflects the personality of the commenter and shows they're thinking while they write. Well, truly this is a breath of fresh air. I, too love giving and getting comments and I love that it's a place to 'meet' new minds and share new thoughts. Your words are especially important right now. Kinder, gentler, more thoughtful should be the word of the day. Thank you Leanne! My pleasure Cathy! You totally get what I'm saying here - it's not about trolls or spammers, it's about commenting thoughtfully and kindly. It's about wanting to engage and connect and affirm - and we need so much more of that these days! i love it when readers share their own experiences about something I've blogged about. But I don't get a lot of comments. I wonder if my blog posts are missing the mark in terms of inviting readers to share--or if people just don't want to take the time to do it. When I do get a good comment, I find it often adds to my thoughts about an issue (value added!). I know what I know and the comments are a chance to find out what I don't know or what I missed. I'm with you on the graciousness and encouragement points. It never hurts to be kind. I try to comment on all the blogs I read, but sometimes it gets so overwhelming, especially on a Monday on BSL. Sometimes I don't comment when I'm not sure what to say. When I'm really overwhelmed, sometimes I don't comment on a post that already has 20 or 30 comments, but I do take the time to comment on someone who has none or just a couple. I'm the same Jennifer, if I need to scroll down through dozens of comments and I haven't got much to say, I tend to leave and write on one that has less. It's more about commenting with intention and grace, rather than dropping a comment that shows you haven't even read the post properly. I am so with you. I always leave positive comments. If you have nothing nice to say, don't say anything! That was one of my mother's favourite things to say Lois - and really wise when it comes down to it - why be hurtful or dismissive when you can be kind? I'm probably more of the cheerleader commenter myself. And while I'm thinking about it - well done you! I feel the same way. We spend a lot of time and energy sharing our thoughts, and it's disheartening when readers don't engage with us. I'd rather they say they disagree with me than say nothing at all. Thanks for giving everyone a reminder that's it's the nice thing to do. 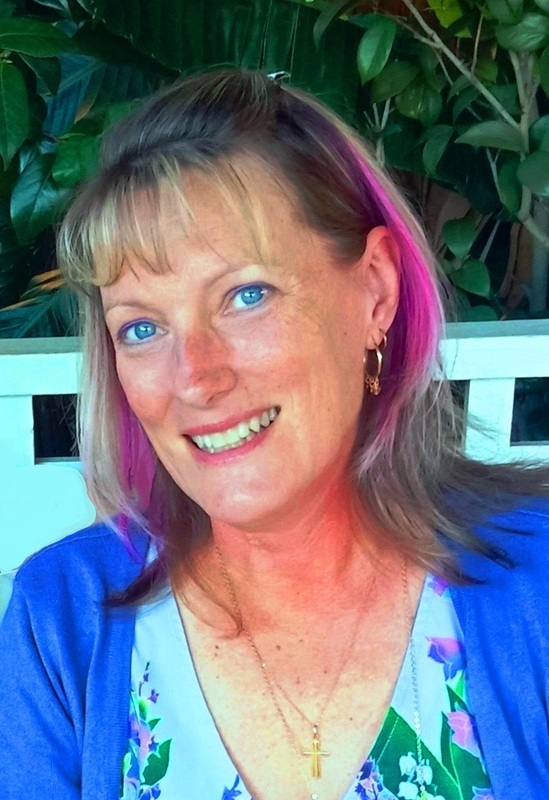 It's all about engagement in my opinion Brenda - I'm not writing to pontificate - I'm doing it to connect and share my story and learn from others. It takes so little time to leave a thought in the comments and it can mean so much. I think we all do it differently Linda - sharing is really just a different version of commenting isn't it? It's the fact that you've read and taken some time to respond that really counts. You spoke what I feel. I often wonder am I speaking only to myself and the crickets. When someone comments I know they read and thought about what I wrote at least for a minute. This is me exactly Tamara - I love it when someone reads what I wrote and "gets it" enough to comment - especially when they share a story of their own in the process. An excellent example of the token gesture comment Shon - thanks for stopping by?? Hi. Leanne,first time here. I found you on Bloggers Pit Stop I'm glad I did. I agree with you about being nice when your posting a comment. If you can't find something nice to say don't say anything at all. You mentioned something about turning off your comments. I wonder if I have done that, I don't get any comments. I will check out your link to I turned off my Comments. Hope someone finds something to comment on I'd love to have comment I can answer. Thanks I'm looking forward to reading more. My mother had the same motto Lyndall - and it holds a lot of truth - I am so tired of people who are thoughtless in how they word their comments. Love this list. I wish people would follow it for everyday conversations.I have to say I have been lucky in the comments department. I have experienced very few comments that did not seem genuine and sincere. There are always a few bad apples but I sometimes an opposing view and even a little snark can help get a good discussion going. Great tips. I am planning a future post on negative comments. You have done it again, among the most clicked, be looking for a feature on Friday.